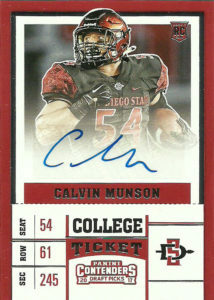 A multi-sport athlete (selected by the St. Louis Cardinals) Calvin Munson elected to follow his passion into football over baseball. An aggressive linebacker for the San Diego St Spartans, Munson had 301 total tackles, 18 sacks, 3 forced fumbles, 5 pass defensed, and 7 interceptions for 244 yards and a whopping 3 touchdowns. Munson was considered a sleeper going into the 2017 NFL draft, with scouts criticizing his intangibles and lack of finesse. He’d go unselected but catch on with the New York Giants. Munson got a lot of looks during the preseason with their linebacker corps so banged up, and he made an impression on special teams. He’d be added to the team’s practice squad and then quickly promoted to the regular roster, starting week 2 at middle linebacker. Calvin played hard and finished his rookie season with 60 tackles, 2 sacks, and a forced fumble. He’d be cut and added back to the practice squad for 2018, but as of the date of this post is currently a free agent.